> "The IACC can assist in the growth and diversification of your business by forming ties between individuals who would otherwise have never met." "The IACC can assist in the growth and diversification of your business by forming ties between individuals who would otherwise have never met." 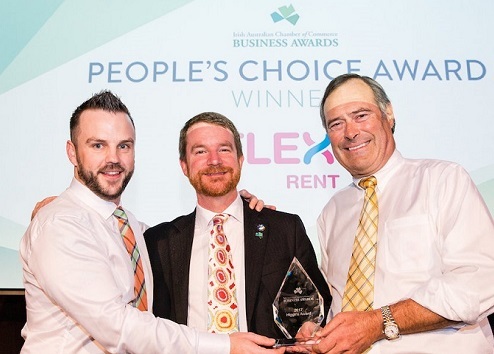 In this guest blog we hear from PJ Byrne (left), Head of Business Development, Sales and Marketing for FlexiGroup Ireland. The 2017 Irish Australian Business Award recipient shares some of his insights in a recent interview with Sinead and Brooke from our Dublin committee. FlexiGroup Ireland is a subsidiary of the Australian parent company, FlexiGroup Australia. The company arrived in Ireland in 2008 and began our journey here in partnership with Harvey Norman. FlexiGroup currently offers two products; Flexirent and Flexi-Fi. Flexirent is our original product. It is a consumer rental product which allows Irish retailers to rent household goods such as TVs, fridges, anything you can think of! Flexi-Fi is our latest offering and is a digital loan type product which allows retailers to be approved for finance of up to €30,000 in under seven minutes through a totally online application. In September we will be launching a new product, the first of its kind in Ireland so the whole team is really excited. Our team currently comprises of 50 outstanding individuals. When we began our journey in 2008 we had only one employee and now, because of hard work, perseverance and passion, we are increasing our team to 75. After 10 years in business in Ireland, the achievements of the team were recognised last October at the Irish Australian Business Awards, which were held in Sydney. FlexiGroup was nominated for and won the “International Trader” award. In addition to this, the company won the prestigious “Higgins Award”, voted for by the public. What are the links between Ireland and Australia for your business? Without the belief and investment from Australia, we wouldn’t be where we are today. Our links to FlexiGroup Australia are evident on a daily basis. We are lucky that both countries are so alike, this aids us in our ability to express what it is we are trying to achieve and as to how we intend to do it. What is it your business is hoping to achieve by strengthening these ties? We are looking for continued investment from our shareholders so we can add more products to our already growing suite. We know the opportunity here in Ireland is great, we just need our Australian owners to buy into our vision and join us on the path to greatness. How long have you been a member of IACC and why did you get involved? FlexiGroup Ireland has been a member of the IACC since 2016. Originally we became involved because we recognised the invaluable contribution that membership would make to our business. Through the IACC we have built relationships with retailers, suppliers and business owners, both here and in Australia. The IACC has provided a sounding board for FlexiGroup Ireland’s message of making finance simple and accessable for both businesses and the Irish public. What do you see as the biggest opportunities for trade between Australia and Ireland? The opportunities for trade between Ireland and Australia are endless. The long-standing relationship between this tiny island and the gargantuan continent in the Southern Hemisphere is a testament to the fact that we are people cut from the same cloth. If we continue to build the relationships between our two countries we will be unstoppable. What do you see as the biggest obstacles to be overcome? The obstacles with regards to trade are obvious. Despite Australia and Ireland having signed a bilateral social security agreement in 2005 to give improved social security protection to people who have lived and/or worked in both Australia and Ireland, there remain issues with regards to trade sanctions and benefits for both citizens. Strengthening our relationships, relying on one another more, and maintaining an open mind are the key factors in overcoming these obstacles. What advice would you share with other companies looking to originate or deepen a trading relationship between the two countries? Relationships matter. Bodies such as the IACC can assist in the growth and diversification of your business by forming ties between individuals who would otherwise have never met. The key to growth and success is learning from others around you and if you surround yourself with the best people, you are guaranteed to come out on top. What’s one thing about your business or role that might surprise? I think the fact that we have come so far so quickly is very surprising. In January 2017 we had six people on the team. Fast forward to today and we have over 50. Even I am surprised! Also in addition to my role as Head of Business Development, Sales and Marketing, I change the lightbulbs, fix the wifi when it goes down and go to the shop for the tea bags when they are low J.. One team one dream! Safari 5.0+ at 1024 x 768 pixels resolution. © Irish Australian Chamber of Commerce.